This film produced during John Wayne’s tenure with Republic Studios not only offers one of the better non western adventures of his career but also as a film we can point to that he would borrow some key phrases from in the years ahead. 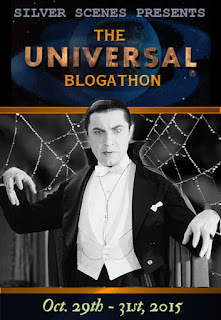 It’s also a film that fueled the imagination of yours truly when catching it over several viewings on Sunday afternoon television while growing up. 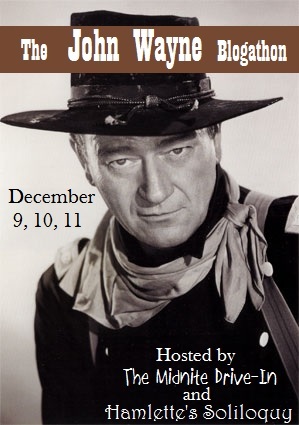 Joining in with other Duke fans via the John Wayne blogathon hosted by Hamlette’s Soliloquy and The Midnight Drive-In has given me an opportunity to pay tribute to both the Duke and a film not often spoken of in the catalogue of John Wayne titles. 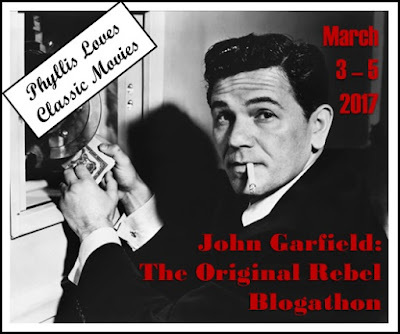 A large part of the film from director Edward Ludwig is told in flashback utilizing Gig Young as the centerpiece of the narration. 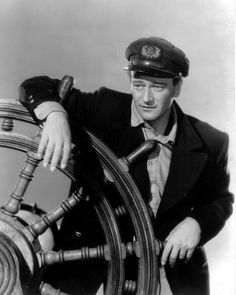 Gig is a young sailor under the seasoned Captain of the Red Witch, John Wayne. 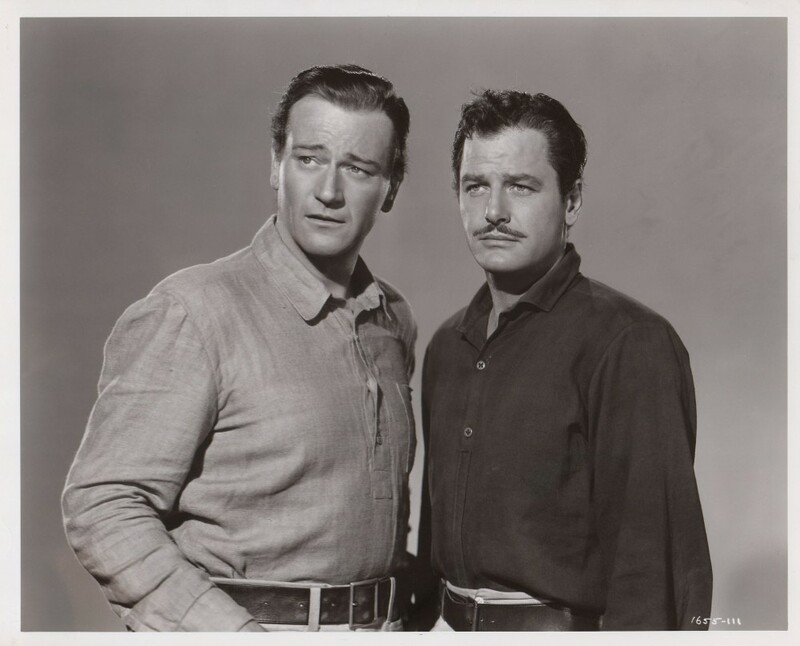 Taking the young Gig into his confidence, along with John Wayne stock company player, Paul Fix, Duke is planning to sink his schooner that has a hull loaded with five million in gold bullion. Gig plays along while poor Jeff Corey is left to be the scapegoat as to the Red Witch’s sinking. A court of inquiry will see no blame aimed at Duke and he’s released from any criminal charges. Duke and his pair of cohorts fully intend to sail back to the secret location of the sinking and reclaim the gold from Davy Jones locker claiming it for themselves, thus stealing it from Duke’s silent partner. In the meantime they find themselves chasing after riches in pearls only to find that a trap has been laid for Duke by Luther Adler, his main adversary in both business and love as we shall soon see. It’s at this point that the first flashback of two will tell Gig of Duke’s past and his tangling previously with Adler. 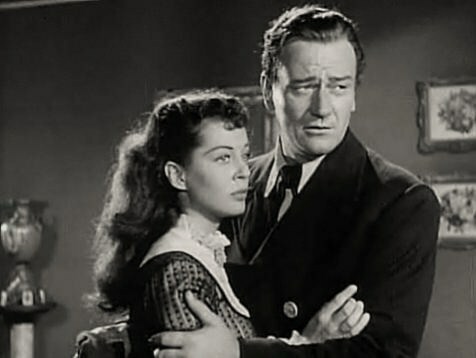 Enter the leading lady and love interest, Gail Russell. This black and white adventure is going to move on to feature Duke tangling with Adler, embracing Miss Russell and verbally sparring with the dastardly Henry Daniell as her Uncle. A giant rubber octopus? It’s in here too as Duke skin dives to an underwater cave in a lagoon to claim a fortune in pearls. 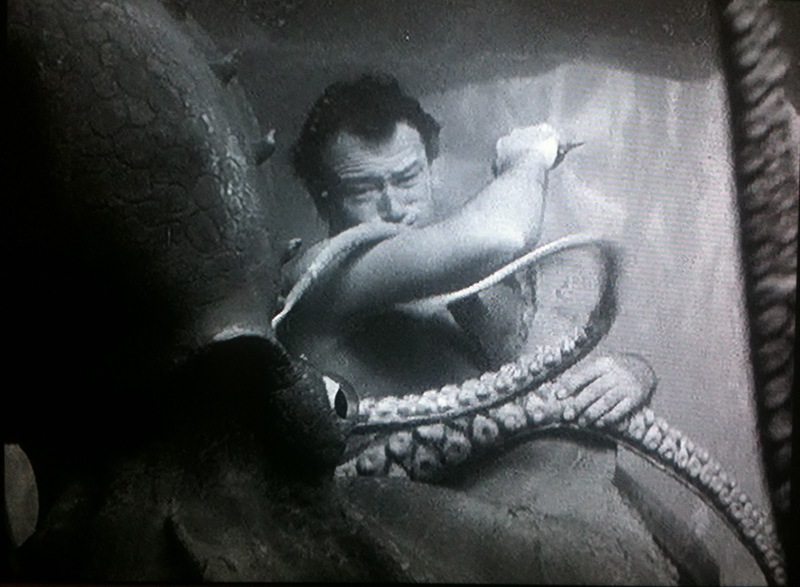 Wayne became a two time fighter of the tentacled undersea creature having already met up with one in DeMille’s Reap the Wild Wind. It’s at this point that things will go against the Duke leaving him in a state of violent drunkenness and prompting the second telling flashback. Still to come is the Duke deep sea diving in heavy boots, helmet and air hose as well as just how he’s going to claim the leading lady from Adler who has bested him to this point in the film. 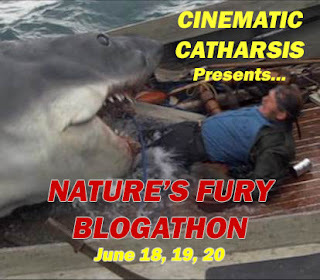 You’ll have to tune in yourself to find out just how this seafaring tale of the Duke wraps up with plenty of underwater footage of Duke and some nice touches utilizing the talents of the special effects department and their miniatures. 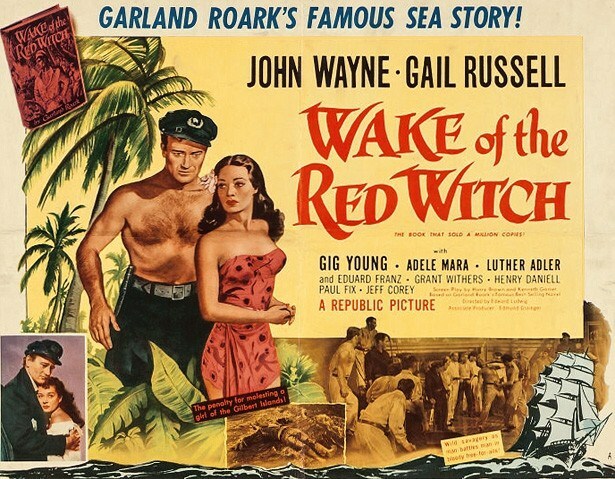 Part of my interest in Wake of the Red Witch lies in the trivia and other facets of the film that we can associate with John Wayne in both his life and career. No stranger to Duke films, Paul Fix gets a meatier role here than some of his other stopovers in Duke’s films. This time out he’s really playing a role one might normally see reserved for Walter Brennan, another Duke regular. Fix makes the best of his scenes as Duke’s jack of all trades, Ripper. It’s also interesting to note that the soon to be blacklisted for his communist affiliations, Jeff Corey appeared here opposite Duke who was a staunch supporter of “the all American way.” Gail Russell had already appeared opposite Duke in his western success, Angel and the Badman and would appear in a number of films opposite the likes of Ladd, Payne and Eddie G. Robinson. Her career would ultimately come to a sad ending at the age of 36 brought on by alcoholism. While Duke was and is the predominant face of the western in movies, it should be pointed out that he loved living life on the water. He owned his own sea vessel, the Wild Goose and the stories of his hanging out with other members of the John Ford stock company about Ford’s own boat, The Araner are the stuff of Hollywood legend. So perhaps his casting as a stern taskmaster commanding a crew aboard the Red Witch shouldn’t be considered much of a stretch. Duke fans I’m sure are well aware of the Batjac label. The company that Duke started in order to produce his own films beginning with Hondo in 1953. The company that employs Duke in this 1948 film and owned in the screenplay by Adler is Batjac Limited. 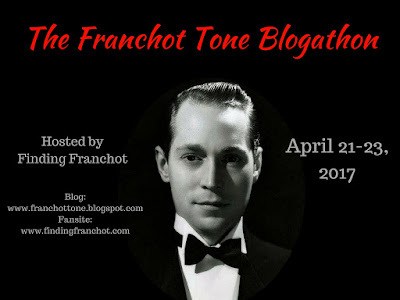 Red Witch made my recent list of favorites known as The Duke Dozen, see if agree with my selections. Finally it should be noted that Duke apparently referred to the cancer that would end his life as “The Red Witch.” At first he beat the “Big C” in the early 60’s but as the seventies wound down, it would return. Knowing this and hearing the final lines of the film from Paul Fix referencing the sunken Red Witch, somehow makes them even more effective. This really is a superior film, beautifully filmed and quite dreamlike in places. 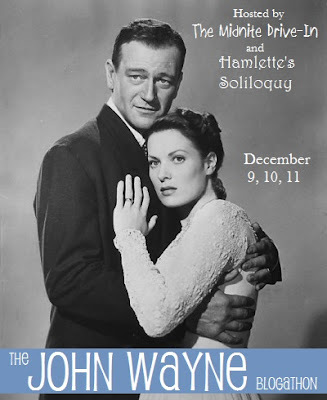 It’s also one of Wayne’s best roles, a very complex part which he handles which great skill. For sure. I was going to get into the violent behavior and great shots of an angered Duke but thought I’d let folks discover this gem for themselves. Made my list of the Duke Dozen last year. It’s a quality piece and it’s a shame it’s not more widely known and appreciated.